The goal is to get both pedals (gas and brake) more level to each other in order to make blipping the throttle more convenient while simultaneously braking (under heavy, medium, or light braking situations). The situation with the 944 or 951 is that the throttle pedal sits too deep in comparison to the brake pedal. This calls for awkward or inconveniently extreme foot angles in order to accomplish blipping the throttle while simultaneously braking with the right foot. What options do we have in order to bring both pedals more level to each other? A) We can opt for adjusting the throttle pedal forward some, or B) we can lower the brake pedal some. Although it may be possible to adjust the throttle pedal height, it turns out to be much easier to opt for adjusting the brake pedal height instead. 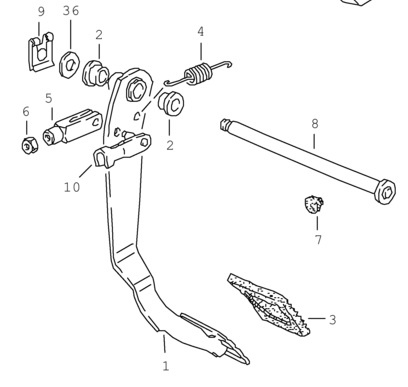 Instructions for adjusting the brake pedal height. Use the 16 mm wrench to counter hold the master cylinder push rod yoke (a.k.a. swivel joint) at the flat sides (seen at the top, 12’oclock position, in the picture below, and #5 in the Diagram above), use the 17mm wrench to loosen the jamb nut a couple of turns. With the 9mm wrench turn the master cylinder rod inward. This will shorten the rod length and allow the brake pedal to get closer to the throttle pedal. Turn the rod enough to allow the brake pedal to move back approximately 3/8 inch. That’s all that is really necessary for the first trial run. With the 16 mm wrench again counter hold the swivel joint, while using with the 17mm wrench to lock the jamb nut snug or 25 ft-lb. The brake light switch (seen at bottom, 6’ o’clock position, in the picture above) now needs to be re-adjusted. Per the workshop manual, set distance between the brake pedal and the switch (threaded collar) to approx. 5 mm (see Diagram-3). The goal is to have brake lights turn off when the pedal is in the fully released position; hence, the switch’s movable tip should compress sufficiently to accomplish this. Use the 17mm wrench to loosen the switch jamb nut, next turn the inside nut to bring the switch in towards the pedal. Now lock the jamb nut snug (this is where a thin span wrench may come in handy, if a thin wrench cannot be obtained, one can make a thin wrench by using a grinder). Now it’s time for a test drive. Perform heel-toe down shifts under three different braking scenarios: light braking, medium braking, and heavy braking. Evaluate the ease of downshifting to see if the brake pedal has been adjusted to your liking or whether it goes too deep in the heavy breaking scenario, or not deep enough in the light braking scenario. Re-adjust brake pedal using the above procedure until you are happy with the final setting. Although the classic procedure is referred to as “heel toe” downshifting, in the 944 it is actually easier to accomplish this downshifting with a “ball and roll” procedure. That is to say, apply the brake pedal with the ball of you right foot, now roll your ankle towards the throttle pedal, and with the side of your foot blip the throttle in order to achieve a smooth downshift. You will find that with the brake pedal adjusted so that it is somewhat level with the throttle pedal under braking conditions, “ball and roll” down shifts are quite easy and fun.